Firstly, I would commend to you Revd Jeff Wilson, our new Diocesan Spiritual Director! Jeff lives in Kirton Lindsey, and trained as an Ordained Local Minister (OLM) during the time Chris and I were living in the next-door parish of Scawby. When the two groups of parishes merged for a while we were both on the same Ministry Team for planning and prayer. He is a thoughtful and gentle disciple of Jesus, but also has a delicious sense of humour! I look forward to working with him on the Secretariat. Well – what a lot has been happening in Lincoln Diocesan Cursillo! I am stunned by the awesomeness of answered prayer concerning several of the sticking-points that had seemed to beset us. Not only finding our new SD, but also a replacement trainer for our next Myers Briggs workshop. Not only the trouble-free recording and completion of our new publicity DVD, but also the opportunity to launch it at “Equip,” the Christian Resources event on the Lincolnshire Showground. Not only the opportunity that Equip gave us to network with other organisations within the diocese and to hand out 200 of our Cursillo leaflets, but also a sense that people were receptive to us and may well attend a Cursillo event in the future! Not only our plans to celebrate the 20th anniversary of the inauguration of Cursillo within the Lincoln diocese at our Winter Event on 3rd January 2015, but also that the National Spiritual Director has agreed to join us for that! Not only has a Task-group to revise our presentation of “The Way of the Cross” been set up, but also various individuals have been pitching in with our publicity requirements. I am very grateful for all the support in advancing our programme. I am aware that we are all volunteers, and that there is a very real committed core “membership” of Cursillo; Disciples of Christ who love Cursillo as much as I do, and long to reach others with the message of unconditional love. May we each offer loving friendship, encouragement and loyalty to each other, with prayer and palanca along the Way! 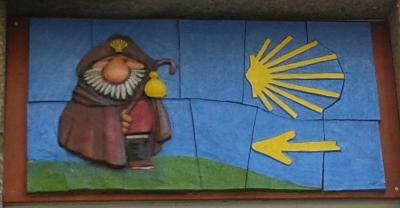 Which reminds me - The Pilgrimage to Santiago de Compostella several of us went on recently was a wonderful experience! You can read in News & Articles some of the responses from various Cursillistas, from other dioceses as well as our own. Looking back with thanks, and forward with hope. There are events in our lives which change us or change our direction. Attending a Cursillo weekend is such an event for us. Certainly, making my own Cursillo came in a year of such events, since I was ordained earlier that year. Now for me there is another event, a change in direction. I have been appointed by Bishop Christopher as Diocesan Spiritual Director. At this point, I would like to give tribute to the Revd. David McCormick, who resigned in July. I thank him, on behalf of all of us, for his contribution to Lincoln Diocesan Cursillo. We will miss David's grace and spirituality. At some point in the future, I hope we will be the beneficiaries of more of his time and talents. So it is with a mixture of sadness, anticipation, and joy that I take up the appointment. To parody the 'Two Ronnies', it's goodbye from him, and hello from me! Like everyone else, when I face a new challenge and feel inadequate for the task, I turn in prayer to God. I ask that you will also pray for God's help for me in this change in direction. I have attended my first Secretariat meeting and emerged relatively unscathed. Already, the Secretariat is planning for next year, starting with the Winter Event, on through to Lincoln #31, with other events between! After Harvest, as we move from All Souls to Remembrance Day, and on towards Advent with it's promise of Christmas, I pray that we may be faithful in our worship and remembering, confident in playing our part in God's plan in our Diocese, and joyful in our service to all God's people. I hope to be able to visit each reunion group, both near and far, over my term of office. I look forward to meeting you all. As Dicken's 'Tiny Tim' says “God bless us, each and every one. On Saturday 4th October several Cursillistas including ourselves arrived at the ‘EQUIP’ event on the Lincolnshire Showground shortly after 7:15 am to help on the Cursillo stand in order to help promote Cursillo in our area. We ‘dressed’ the stand with colour!, information and our new Promotional DVD was playing all day!. We served orange juice and butterfly cakes to the many people who came to us for more information. 199 leaflets were given out! We also had two half-hour slots on the ‘stage’ where Liz introduced the DVD and gave a short talk. 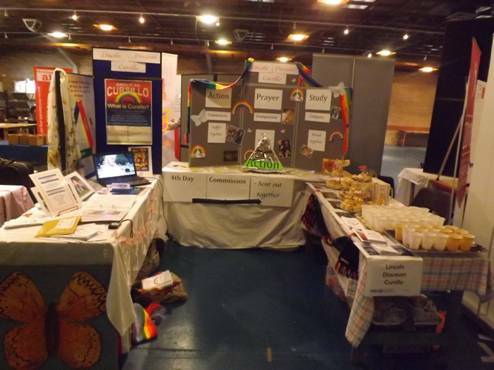 The event had been organised by the Churches Together in all Lincolnshire (www.ctal.org.uk) and so our stand was only one of many from all different organisations. All in all a very enjoyable day! Seven chilled out Cursillestas emerged from the Alford Group quiet day ready to take on the world, eager to serve their Lord. We met at Stixwould, near Woodhall Spa, where we looked at Luke as a companion, healer and communicant or and how this can give us energy to our mission and discipleship. We ran the day ourselves, thoroughly enjoying each other's company, relaxed in our relationship. Our hosts, Graham and Val Byers welcomed us with unlimited tea, coffee and biscuits, with a most enjoyable lunch to mark the passing of our day. For those who have not had the privilege of going to Stixwould, it is an old signal box, refurbished and enlarged to make a comfortable retreat for groups of ten or even single retreats. This was generously priced at £20 per head, excellent for such a peaceful environment. If we wanted a contrast to watching the flowing river in front then we could walk for miles along the river pathway. Not that we did much of the latter as the heavens opened and threw the remnants of hurricane Gonzales at us, but we were warmly ensconced behind double glazing. I think another visit is on the cards. Ultreyas are always uplifting, especially the National ones. Canterbury was definitely one of the best; after all it was in the Cathedral that is at the heart of our faith. Twelve good 'men' and true from Lincoln became disciples for the day, sang their hearts out and absorbed the teaching at the feet of the Bishop of Dover, Trevor Willmott. In his sermon the Bishop invited us to 'take off our sandals as we were on Holy ground and then follow Christ. Our reading from Exodus 3:1-15 tells of God speaking to Moses from the burning bush challenging him to follow. It isn't easy as Peter found out. The gospel reading (Matt 16 21-28) was Jesus foretelling of His death and Peter rejecting such a mind blowing thought, even trying to prevent Jesus from going. The Bishop reminded us that we had not come to Canterbury for a love-in but to acknowledge God through Cursillo and in our uniqueness respond and serve Him. Not in judgement, but in love and encouragement. We find God in our failures, in all the murkiness of life. God says from within the darkness, 'Here I am'. Reflections on the Santiago Pilgrimage. Some of me was dreading the physical exertion, and no doubt pain, this was going to demand, but more so the dread of not managing it and having to stop walking! However, more important to me than all this was the longing for time aside – a chance to communicate with God, away from the distractions of “ordinary” life. I was spiritually exhausted, and here was a chance to let go and let God! There were 27 Pilgrims in all, some of whom were planning to walk, and others to travel by coach and enjoy some sight-seeing. The two groups met up each day to share experiences and reflect on the day. All of us collected “stamps” for our Pilgrim “passports.” Those who managed to walk over 100 km in total were presented with certificates, but I think all of us were acknowledged as Pilgrims in our desire to walk with God during the week. There was so much to see and absorb. Personally I dropped back from the main group of walkers each morning, to allow specific God-time. I had been given a booklet from Canterbury about the nature of Pilgrimage, and this stressed the importance of the journey being more important than the destination. The first day I just enjoyed the walking, and tried to take in all I saw around me – it was a veritable harvest festival in Northern Spain! So much to rejoice in and give thanks for. I was fascinated, too, by how the Camino (the Way) impacted on the countryside and the local culture. Locals periodically left food and drink for Pilgrims, with an honesty box for those who cared to donate! Cafes and hostels were all along the route, so there was no need to carry your own supplies! The kilometres were marked on stones at every 500 metres, and these became very encouraging as we counted down, having begun at 111 km from Santiago! It was traditional for Pilgrims to leave stones or messages on these stones. I took to placing an acorn on each one, as a symbol of submitting myself to Christ. Gradually my mind grew more peaceful. 89km to go! Early on the 2nd day I realised that my head was in as much of a spin as when I had begun, and I heard God shout at me: “Be still and know that I am God!” Yes – that was it! The first day I had been especially aware of God as Creator. This second day I shortened the quote to “Be still and know that I am.” I dwelt briefly on several “I am” statements, and then became of a fresh one God was giving me: “I am your Companion on the Way!” The sense of His presence was so powerful that I could almost physically feel Him holding my hand! Unfortunately I “hit my wall” physically that afternoon, and was glad to hold Chris’s real hand to help me as my muscles and feet begged for mercy! 65km to go! Day 3 – “Be still and know.” What do you want me to know God? Here followed a flood of “I know that . . .” statements, based on Scripture, which I could hardly keep up with writing down in my journal! Such precious promises of reassurance and encouragement, which would take too long to explain in this article! Ask me one day! 43 km to go! Day 4 – “Be still.” What can I say? Be still my soul. It did! The walk became me, and I became the walk. There was a real sense of stillness, and it was so good not to be stressing about things. I just stepped out and enjoyed the rhythm of life. I made steady progress despite my feet being wrecked by now! By the afternoon I was glad of Chris by my side as my pacemaker - I was exhausted! 21 km to go! Day 5 – “BE!” Take my life, and let it be consecrated Lord to Thee. I choose to be Holy. But it wasn’t long before my thoughts were interrupted today. The countdown markers stopped at 11km to go – strangely dispiriting! However, the way was still well marked. We met up with the coach-party people at 4km to go, so that we could walk into Santiago together. In the end, I found the approach through the outskirts of the town disappointing. It was exciting in one way, but exhaustion was uppermost. However, it was good to see the towers of the Cathedral at last! 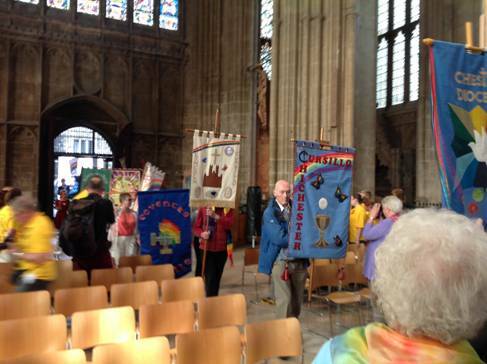 We were whisked through the Cathedral to go to queue up (90 minutes standing – not good! )for our Certificates of Pilgrimage. I was disappointed not to have the chance to pause in the great building to give thanks. However, there was the opportunity to fulfil that closure on . 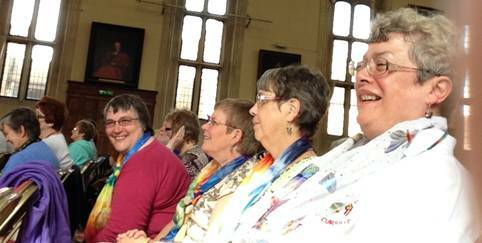 . .
Day 6 – Sunday - when we went to the Pilgrims’ Mass in the Cathedral. It was packed with Pilgrims from different nations. The prior Mass has only just ended and there was a strong smell of incense. A special welcome was given to Pilgrims of the Way, with the hope that we find encouragement on our quest for God. Prayers in different languages were offered by visiting clergy, some of whom we recognised from the walk. 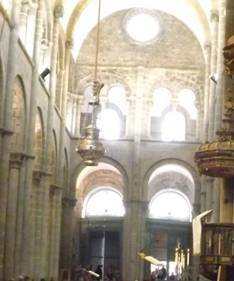 Chris and I had briefly visited the Cathedral a couple of years previously, but not as “Pilgrims proper!” This was a very different experience, and the huge censor swinging at the close of the service meant so much more – the “Wow factor” gave a glimpse of the awesomeness of God. Day 7 – the journey home brought mixed feelings. I was looking forward to being back with the family, but aware that I may lose some of the stress-free “me” that I had discovered. May that “space” with God continue now that I am home? May I make it a priority to seek Him out. Amen. Have just about got over the blisters, sore feet and aching knees. Still not got our heads around the experience though. There is a very big sense of anticlimax when you get home again. Similar perhaps to the come down after a Cursillo weekend. "Look up, look inside, don't look down." which seemed a good adage to help us on our way. I don't know about you but I'm still on a high! It was great to go on a Quiet Day soon afterwards when more reflections came out. I really have no regrets about our Pilgrimage but so wish I could have had time to jot down reflections as the days unfurled but there hardly seemed time when we weren't walking (or eating)! I'm not good at multi tasking ie walking and writing. 2. On a long hot stretch of tarmac a Belgian gentleman caught me up and we chatted for at least a kilometre, thus helping me (and probably him) along. I did the whole walk 'with the Grace of God'. I couldn't have done it otherwise. I hadn't walked 16-17 miles in a day for many years let alone day after day. I had done plenty of training beforehand but my longest walks during that time had been 11 miles. Christine, Rowena and I went to La Coruna after the Pilgrims Mass. In many ways it was a pity not to see more of Santiago but it felt right to stand in the sea and watch the waves crashing over the rocks as Tom had done in the film 'The Way', to reflect on where we had come from and look forward to where we may be going. What arrows do you follow? Who or What do you look to in life to point the way? What excessive baggage are you carrying in life? How do I face the pains of life? Do you have life wounds which you need to deal with? What would it look like for you to be a walking stick for others? What changes have you experienced on the Camino? What steps do you need to take to be a true pilgrim in life? It was with trepidation and fear of ‘can we do it’ that gripped us as we collected together in Sarria to start our 110km walk on the Camino over the next 5 days to Santiago de Compostela. We had practised by walking over the summer and every day for a week before leaving. 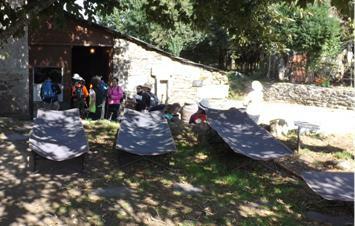 Our Camino passports had been stamped, the toilets had been visited and we were off. Julie’s knees were taped up to hold them together and I was walking without a map or compass. Would we get lost! I had no need to worry. 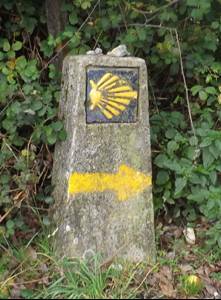 Over the years many had walked the Camino and all we had to do was to follow the Yellow Arrows. They were everywhere. 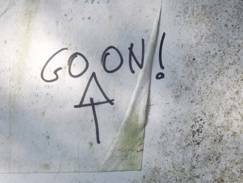 On the side of buildings, round tress, on lamp posts, on the ground and on one occasion on a wheelie bin. (thank goodness it was not bin day!). You soon learnt that your way had been marked for you by someone who had gone before. Sometimes we were not sure where we were. But we soon found a yellow arrow that reassured us that we were on the right track. Julie’s knees were holding out.! We started most days at a slow pace, and soon had to stop for a cuppa in one of the villages. However by the middle of the afternoon with the finishing post in site we moved forward with determination to reach our journeys end. Every 1/2km there is a sign post giving the distance to Santiago. On the post is a Scallop Shell. In the past a pilgrim on reaching the end of the journey received a special manuscript and a scallop shell to hang on to their back or hat. 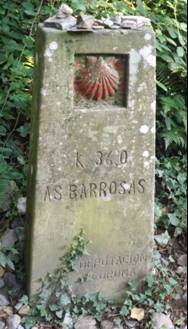 This symbol was to represent the changed life they had experienced as they walked the Camino and that they were now a different person. We soon all had our own shell attached to the back of our rucksacks. Being able to workout how far we still had to walk was comforting and the relief of arriving at the anticipated next marker was reassuring. On top of the marker you would find small stones reverently placed with a prayer by a passing pilgrim. Some had been carried for many days and others picked up close by. A message, a prayer or name was sometimes written on them or on a piece of paper, sometimes laminated to protect from the hostile environment around. 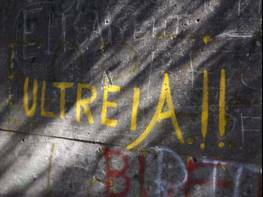 Many of the Markers as well as the odd wall, often in underpasses had been adorned with messages, names and symbols. Some we could read and others perhaps fortunately we could not! Often a simple ‘you can make it’ and an ‘Ultreya’ put an extra step on your way. We were walking the Camino to help raise funds for Harry, a 2 year old boy and his family. He had recently had his third operation on his head to attempt to relieve pressure on his brain. We had a purpose to complete each day, something to make us carry on. Around us were other pilgrims all with different reasons to be walking or cycling but all with a common purpose to complete the journey, to arrive at the end and to return home renewed in a new life. 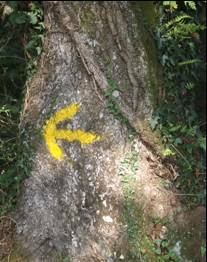 Help was always at hand, encouragement from fellow pilgrims with a ‘Buen Camino!’, a rest stop and refreshments, a marker post and a yellow arrow all pointing in the right direction. In this day of technology encouragement was also coming in the form of text messages, electronic palanca, received regularly during the day, providing that uplift to help move on that tired body. The body needs not only spiritual help but nourishment as well. Most villages would have a café serving food and drinks. What was remarkable was the modest cost and appreciation of your needs. In one village, through a church organisation, tea or coffee was free and there were even camp beds for those too tired to carry on. On the fifth and last day it was noticeable at the first watering hole that there was excitement among the pilgrims, we were nearly there, and we are going to make it. There was a general buzz and determination in the groups as they arrived and left to complete the last leg. Just before Santiago de Compostela we were joined by most of the non walking party and together we completed the Camino to arrive all together at the Cathedral. A quick tour was followed by a wait for over an hour for our certificates. A queue of fellow pilgrims all waiting patiently, but then what’s an hour when some had been walking for over a month. The next day Sunday we were early into the cathedral and managed to find seats for the Pilgrims’ Mass. Though it was in Spanish we had no difficulty in taking part in the service and left on cloud nine especially as they swung the incense burner hanging from the roof. All too soon we were heading home. Most by plane, some by train and us by car and ferry. Once home among all the usual chaotic turmoil that usually ensures was that feeling, we’d done it, we’d experienced it, and we won’t forget it. It took some time to get down to earth. You want to rush up to every one and say we’d done the Camino. But you know they’ll look blankly at you. You know you've done it. You've taken one more step along the road. This Palanca Poem by Harry’s Grandmother was texted to Julie during the Camino. You know that you’ll get there.